David decided to hit us with a series of heavy main courses, so we got off a little easy on the starters... like this simple salad with just frisée, radish, endive and herbs. A little green (OK, this wasn't that green...) never hurt nobody. Whole steamed Breton artichoke, anchoaïde - and more green! Before On Lot 10, I had also never had eaten artichokes whole, either... so it was natural for the guests to be surprised at the sight of these large spheres. So nice with the tart anchoaïde. Boudin Basque "Christian Parra", pimente d'Espelette - the question was raised regarding the difference between a boudin Basque and a regular boudin noir, and David said that with the former, there was higher fat and collagen content coming from the pork cheeks and skin, and also spices used (such as garlic and piment d'Espelette). One more difference that I can see in this would be that the pork was shredded, not ground. In any case, I looooove this. It's what made me fall in love with this restaurant on my very first visit. We were told there was to be a fish head, and it turned out to be this holy-mother-of-all-fish-heads! It's a giant grouper (龍躉) fish head from a fish that was caught today - not farmed - which weighed around 70 catties... and what we had was only HALF a head! If you wanna get a feel for the size of this thing, just look at the green capers on top... or use the fork for reference. No, none of us have had eaten a fish head like that in our lives... and probably only tuna heads can measure up to this. Angel hair "paella-style" with Palamós prawns and buchot mussels - one of the reasons we love David is his willingness to experiment and create new dishes. Having had his delicious paella numerous times with different toppings, he's decided to show us something different - taking out the rice and replacing it with angel hair pasta. This was pure genius. Besides the layer of pasta which had absorbed all the incredible flavors - and parts of which had also formed a crust like the socarrat or rice crispies - there was plenty of chorizo, pimentos, onions...etc. You also had buchot mussels and those amazing Palamós prawns. The prawn heads were still incredible and I wasted no time in sucking out whatever I could, but the real beauty lie in the fact that the tails were done mi-cuit! Incroyable! Lomo de Rubia Galega - ah, the 12-year old beef, dry-aged for 120-days or more. With our gang split up into two separate but adjacent tables, we got two pieces of strip loin instead of one big ribeye. It's natural to expect that an old ox would produce meat that was tougher and more chewy, hence the extended dry-aging period. The stirploin was also a tougher cut of meat compared to the ribeye, but overall this was still a very juicy piece of beef. The flavors, of course, were out of this world. I can't get enough of that cheesy taste. Needless to say, the taters were also very, very popular. The final course tonight came in a large, oval cocotte. The rice bird baked rice takes its inspiration from the Portuguese arroz de pato -with long-grained rice baked with shredded meat from duck leg confit. Add to this chunks of yummy foie gras, ceps, rice birds and thin slices of ham... and you have one incredible dish. Most of us were so full - and left staring at the amount of leftovers - that we didn't want any dessert. Some people did ask for some... and got the usual tarte citron and tarte Bourdaloue. 2002 Louis Roederer Cristal en magnum - nice and ripe, sweet on the palate, with good acidity on the finish. Pretty toasty with lemon and almost marmalade on the nose. 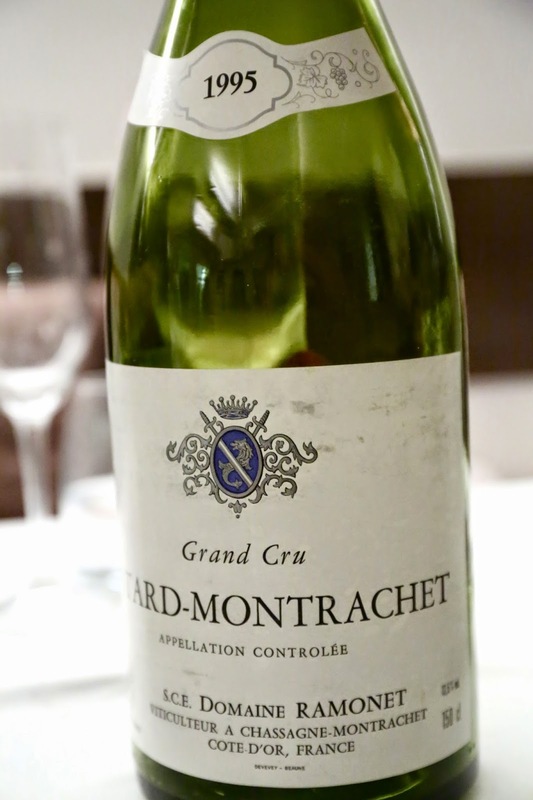 1995 Ramonet Bâtard-Montrachet en magnum - nice nose with notes of straw, butter and a little marmalade. Nose was oxidized but in a good way. Color was starting to turn golden. 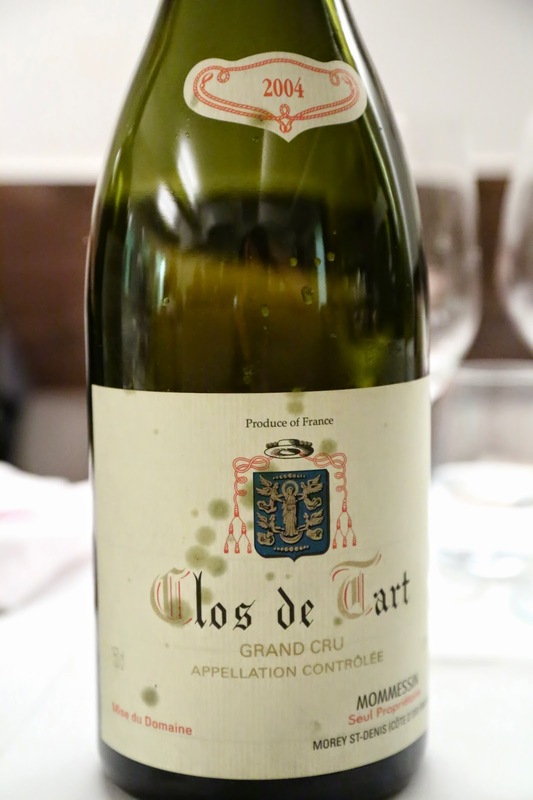 2004 Mommessin Clos de Tart en magnum - very nice and fruity, with strawberry notes. More elegant than I expected, but maybe that's a sign of the lighter vintage. 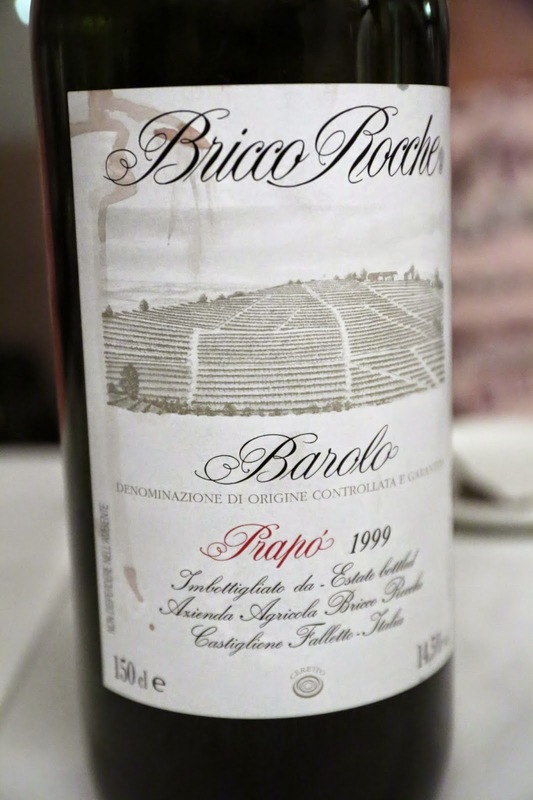 1999 Ceretto Barolo Prapò from magnum - clearly more tannic here. Nose of ripe fruit, forest, cedar and a little smoky. Very, very nice actually. Well, I think I discharged my duties reasonably well tonight. A lot of full bellies and smiling faces all around. But maybe that's from the wine... Hopefully I've made some new friends today, and increased the David Lai Fan Club to include a few more fans from Taiwan. Last time I was pretending to be hak hei by not choosing this restaurant when dining with you, as you are probably asked on a weekly basis but that is it. No more. Next time I'm back, please can we go here?!? I am so jealous. RICE BIRDS????? one of my favourite foods in the world?